This dungeon is used during the Grand Tree Quest. Completing this quest gives you access to the dungeon any time you want, and allows you to use its mine. 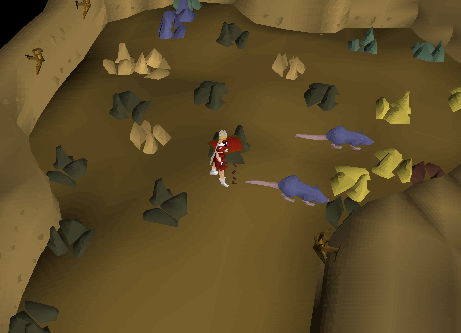 To get to the dungeon, head northwest from Ardougne to arrive at the Gnome Stronghold. 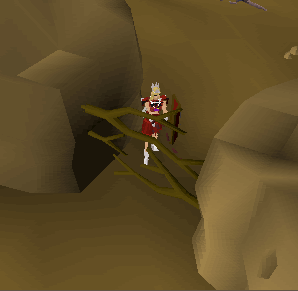 An alternative way to get to the Stronghold is to use the Spirit Trees. When you teleport to the stronghold using one of these trees, you will arrive in the location indicated by a turquoise circle on the map. The last way to get here is to use Gnome Gliders. These can be used after you complete the Grand Tree quest and can fly you around the world of RuneScape. The glider will fly you to the very top of the tree. To get to the foyer, go down 3 ladders. 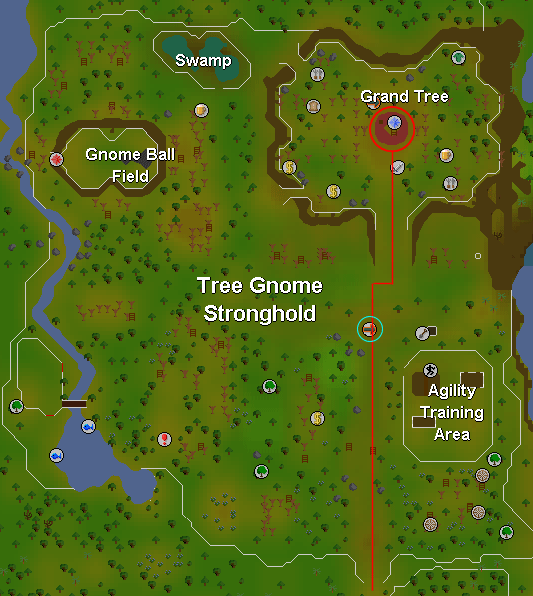 For information about Spirit Trees and Gnome Gliders, please refer to the Getting Around Runescape guide. Talk to King Narnode to start the Grand Tree Quest needed to get into the dungeon. If you have completed the quest, you can go down the trapdoor into the dungeon. 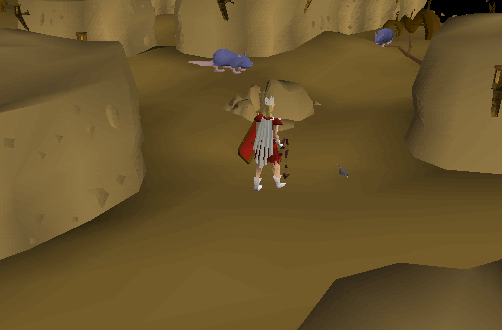 The entire dungeon is also scattered with level 2 Giant Rats. To get to the mining rocks, head into the north chamber. To get into the north chamber you must push some roots out of the way; to do this simply click on them. This mine is often empty and never busy, so it is a good place if you want to mine somewhere undisturbed. 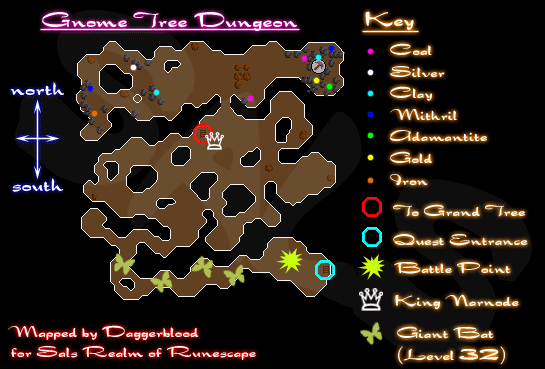 The entire rest of the dungeon is empty (as shown in image below) - and apart from playing a small part in the Grand Tree quest (see below), remains unused. The map shows also the point at which you battle the demon at the end of the quest, indicated by a yellow star. You may notice that the rest of the dungeon is filled with roots, you can see a few in the corner of the above image - these roots play a role at the end of the Grand Tree quest. King Narnode will ask you to find the Daconia Rock which is hidden in the roots of the Grand Tree. To find the rock, you must search (right-click and then search) the roots within the dungeon. The location of the Daconia Rock varies between players. The nearest bank can be found in the Grand Tree. 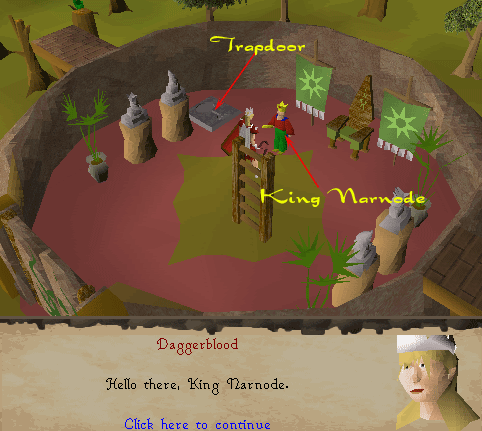 To get to this bank, exit the dungeon via the ladder near King Narnode that leads to the foyer (shown by the red circle on the map). Now climb up the ladder in the foyer to the 1st floor, from here head west and south to the bank.